Why not see Iceland’s most famous attraction while horse riding in Iceland. It is the most authentic way to travel and much more fun than driving a car. Our Golden Circle tour was nominated by CNNgo as one of the 15 greatest horse treks in the world and we are really proud of that. The Golden Circle tour is perfect for families and riders who are intermediate riders and like to try out the Icelandic Horse as well as seeing Icelandic countrysides breathtaking nature. 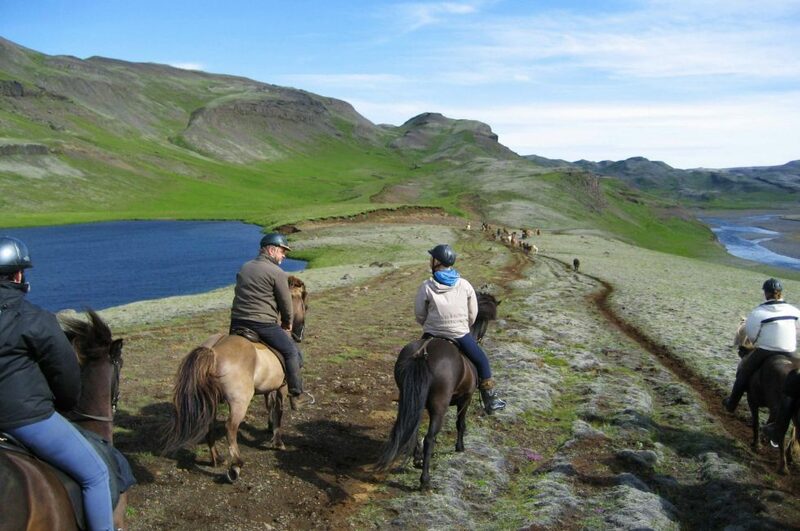 Horse riding in Iceland is the most authentic way to travel and of course much more fun than driving or walking! Brúarhlöð is an extremely beautiful rock formation in Hvítá river. The river has formed the Breccias rocks for thousands of years into impressive formations. The river in the gorge is about 10 meters deep and in the middle of the river is a large rock standing out. The majestic waterfall Gullfoss or the Golden waterfall like it means in English is located on the Hvíta river which streams from the glacier Langjökull. Its height is 32m and its average flow rate is about 140 m3/s. The waterfall is one of the most famous attractions here in Iceland which is no surprise due to its beauty. Hrepphólar is a basalt column located in Hrunaheidi heath. It sure is a sight to see even though there are some mining in place. After seeing these columns we ride to Hrunaréttir which is a famous place in South Iceland for rounding up sheep in autumns. Hrunaréttir is made out of the basalts columns at Hrepphólar.